A top college admissions insider exposes the never-before revealed secrets to getting into one of America’s elite colleges. Your child is smart. Your child is on the honor roll. Your child aced the SAT. But is it enough to get into a top-tier college? 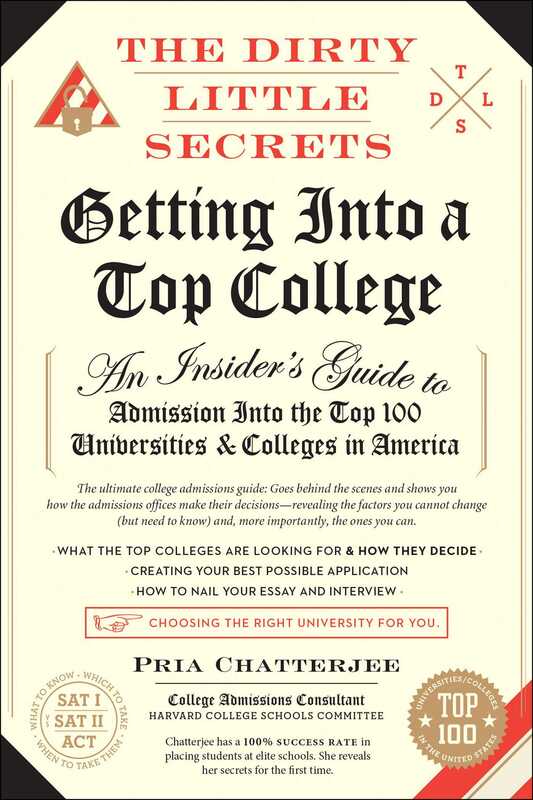 In the Dirty Little Secrets of Getting into a Top College, educational consultant Pria Chatterjee simplifies the complicated process of college admissions, providing parents and students with the tools needed to secure a spot at one of America’s most competitive colleges. In the spirit of Kitchen Confidential, Chatterjee gives readers an exclusive look inside the college admissions office—and the mind of a college admissions officer—and exposes just what elite schools look for in a potential student. Through a series of real-world case studies and with a store of deep insider knowledge, Chatterjee will help you navigate the thicket of college admissions and show parents and students what skills and attributes to stress (and what to downplay) when applying to your dream school. • 100% SUCCESS RATE: This is the bullet proof guide to getting into a top college from a consultant with a 100 percent success rate getting her clients into one of America’s best universities. • INSIDER KNOWLEDGE: Last year 35,000 students applied to Harvard. Only 6 percent were accepted. Chatterjee, a Harvard alum who interviews potential Harvard students as a member of the university’s schools committee, explains that you too can be a member of that elite group. But you must stress the right qualifications.